(1) The electronic tax liability register under sub-section (7) of section 35 shall be maintained in FORM GST PMT-1 on the Common Portal and all amounts payable by a taxable person shall be debited to the said register. 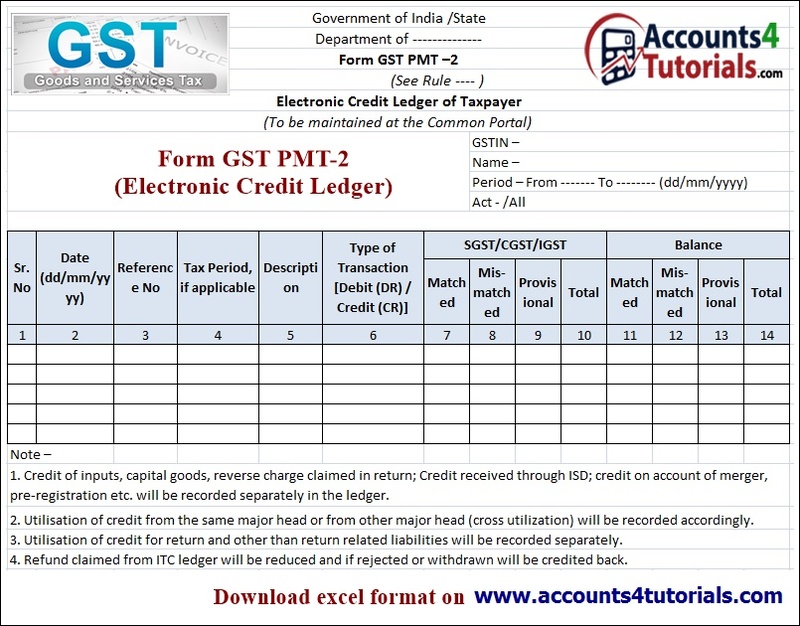 (3) Subject to the provisions of section 35, payment of every liability by a registered taxable person as per his return shall be made by debiting the electronic credit ledger maintained as per rule 2 and/or, as the case may be, the electronic cash ledger maintained as per rule 3 and the electronic tax liability register shall be credited accordingly. 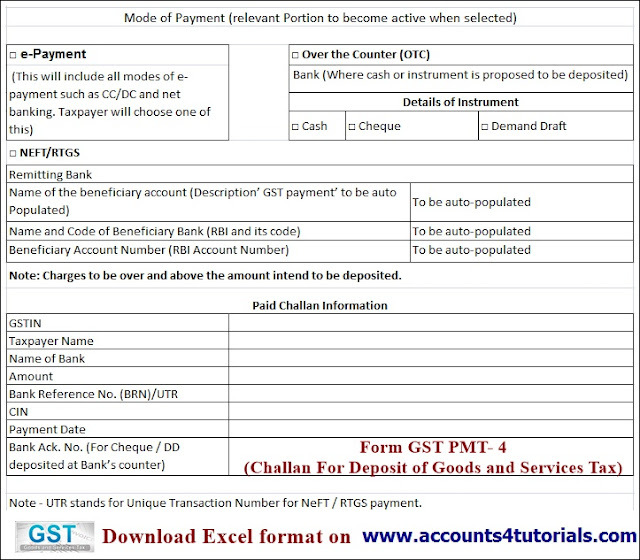 (4) The amount deducted under section 37, or the amount collected under section 43C, or the amount payable under sub-section (3) of section 7, or the amount payable under section 8, or any amount payable towards interest, penalty, fee or any other amount shall be paid by debiting the electronic cash ledger maintained as per rule 3 and the electronic tax liability register shall be credited accordingly. 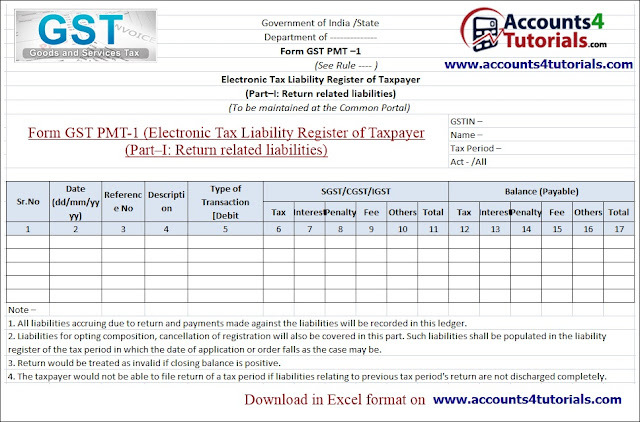 (5) Any amount of demand debited in the electronic tax liability register shall stand reduced to the extent of relief given by the appellate authority and the electronic tax liability register shall be credited accordingly. 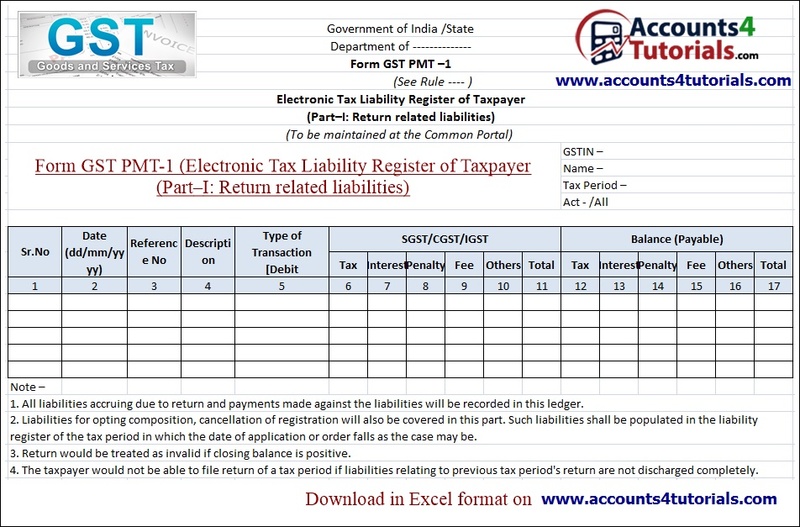 (6) The amount of penalty imposed shall stand reduced partly or fully, as the case may be, if the taxable person makes the payment of tax, interest and penalty specified in the show cause notice or demand order, as the case may be, and the electronic tax liability register shall be credited accordingly. (1) The electronic credit ledger shall be maintained in FORM GST PMT-2 for each registered taxable person on the Common Portal and every claim of input tax credit under the Act shall be credited to the said Ledger. (2) The electronic credit ledger shall be debited to the extent of discharge of any liability in accordance with section 35. (3) Where a registered taxable person has claimed refund of any unutilized amount from the electronic credit ledger in terms of section 38, the amount to the extent of the claim shall be debited in the said ledger. (4) If the refund so filed is rejected, either fully or partly, the amount debited under sub- rule (3), to the extent of rejection, shall be re-credited to the electronic credit ledger by the proper officer by an order made in FORM GST PMT-2A. Explanation.– For the purpose of this rule, a refund shall be deemed to be rejected, if the appeal is finally rejected or if the claimant gives an undertaking in writing to the proper officer that he shall not file an appeal. 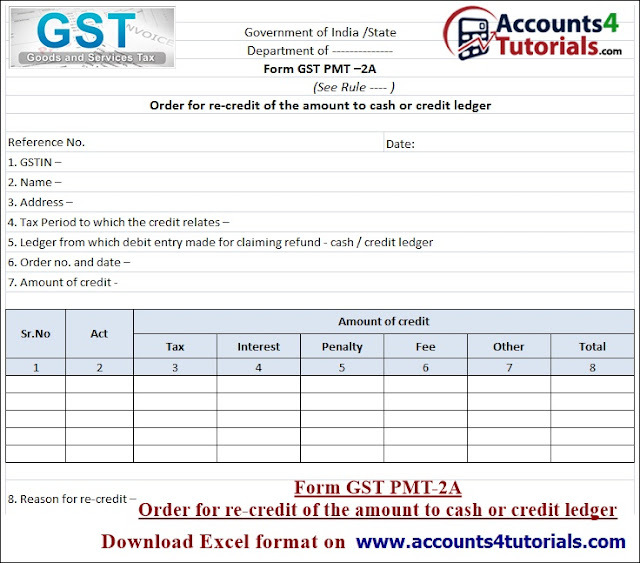 (1) The electronic cash ledger under sub-section (1) of section 35 shall be maintained in FORM GST PMT-3 for each registered taxable person on the Common Portal for crediting the amount deposited and debiting the payment therefrom towards tax, interest, penalty, fee or any other amount. 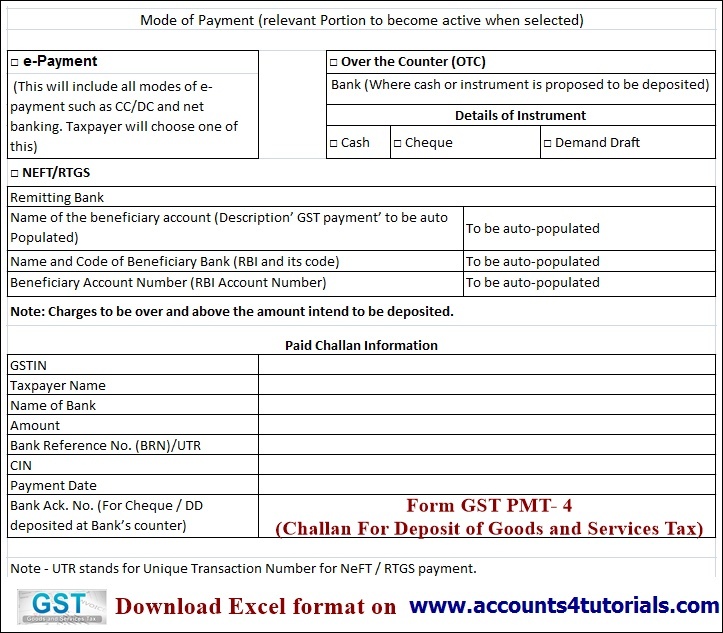 (2)A registered taxable person, or any other person on his behalf, shall generate a challan in FORM GST PMT-4 on the Common Portal and enter the details of the amount to be deposited by him towards tax, interest, penalty, fees or any other amount. Provided further that the challan in FORM GST PMT-4 generated at the Common Portal shall be valid for a period of fifteen days. Explanation.– For making payment of any amount indicated in the challan, the commission, if any, payable in respect of such payment shall be borne by the taxable person making such payment. 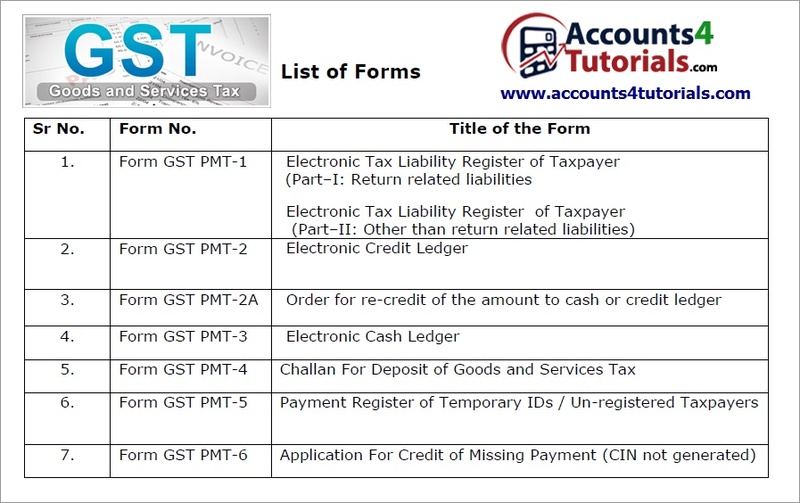 (4) Any payment required to be made by a person who is not registered under the Act, shall be made on the basis of a temporary identification number generated by the proper officer through the Common Portal and the details of such payment shall be recorded in a register in FORM GST PMT-5, to be maintained on the Common Portal. 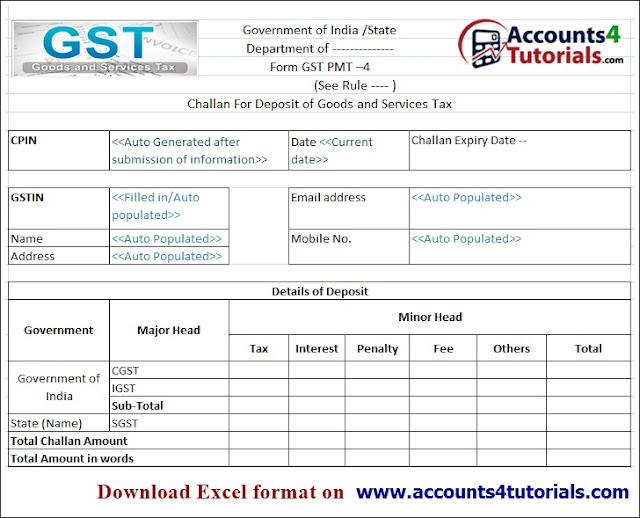 Provided that where the bank account of the concerned taxable person, or the person making the deposit on his behalf, is debited but no Challan Identification Number (CIN) is generated, the said person may represent electronically in FORM GST PMT-6 through the Common Portal to the Bank or electronic gateway through which the deposit was initiated. (7) On receipt of CIN from the authorized Bank, the said amount shall be credited to the electronic cash ledger of the registered taxable person who, or on whose behalf, the deposit has been made and the Common Portal shall make available a receipt to this effect. (8) Any amount deducted under section 37 or collected under section 43C and claimed in FORM GSTR-2 by the registered taxable person from whom the said amount was deducted or, as the case may be, collected shall be credited to his electronic cash ledger as per rule Return.2. 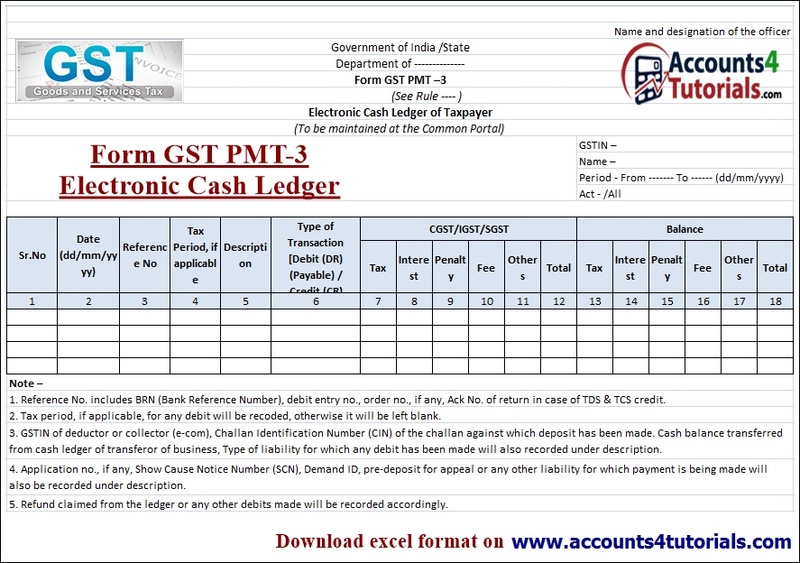 (9) Where a taxable person has claimed refund of any amount from the electronic cash ledger, the said amount shall be debited to the electronic cash ledger. 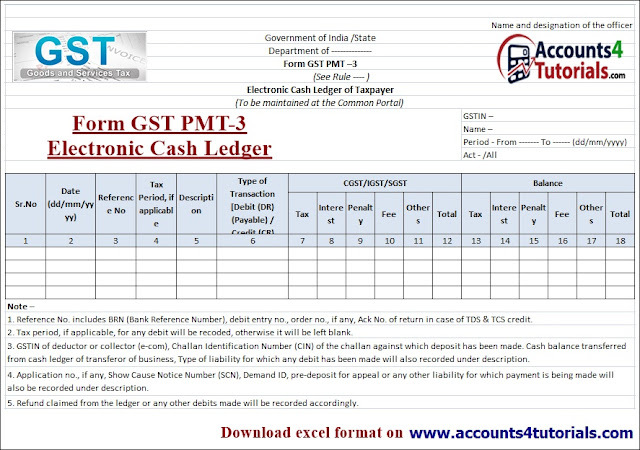 (10) If the refund so filed is rejected, either fully or partly, the amount debited under sub- rule (9), to the extent of rejection, shall be credited to the electronic cash ledger by the proper officer by an order made in FORM GST PMT-2A. Explanation,- For the purpose of this rule, a refund shall be deemed to be rejected if the appeal is finally rejected or if the claimant gives an undertaking in writing to the proper officer that he shall not file an appeal. 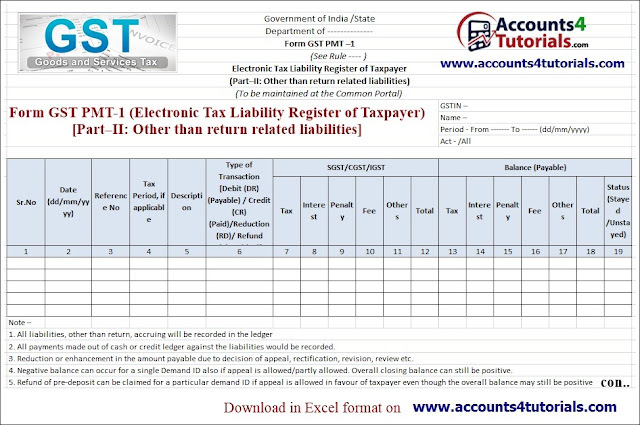 (3) A unique identification number shall be generated at the Common Portal for each credit in the electronic tax liability register for reasons other than those covered under sub- rule (2).